Throughout our trip, we have encountered the generosity of family and friends who truly believe in our dreams and help where they can. Family and friends have offered us places to stay, meals, recommendations and more – and we cannot be more grateful. We started our trip internationally in Colombia, because Steve’s friend, William lives here, and we thought it might be an easier transition if we can start with some familiarity. William has gone above and beyond to help us, and for that, we are truly humbled and thankful. We are very lucky to have amazing people in our lives. Our trip started with a flight to Miami, and then on to Medellín, Colombia via VivaColombia Airlines. VivaColombia is similar to Southwest Airlines in the United States. VivaColombia has changed the way people travel, offering for the first time, low costs flights that opens the doors to travel for Colombians. We landed at José María Cordóva International Airport (Medellín; MDE), which located in Rionegro about 45mins outside Medellín, close to 2AM, and were impressed with how quickly we got through customs. By the time we made it to our hotel that night, we were exhausted. Sleep didn’t come easy, because we were excited to start seeing Colombia! The next morning, we had a tour to El Peñól & Guatapé. El Peñól is a small city just a few hours from Medellín. While driving through El Peñól, we loved seeing the massive farms. There were several times on our drive that we would have to slow down for horses, cows, and even caballeros. 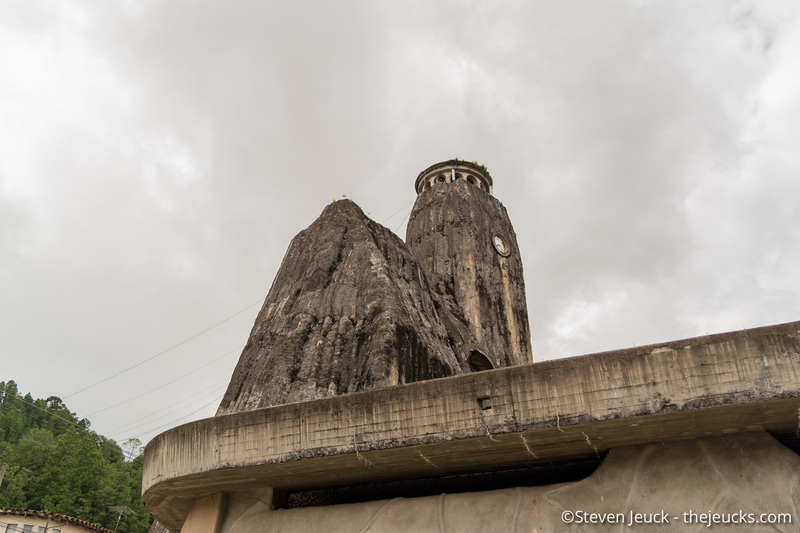 In El Peñól, we made a stop to visit a church that was carved out of rock. Our guide, Jose, told us it was built out of a meteor, but I am not able to find any evidence online to help backup the claim. Regardless of how it was made, it was beautiful. We also stopped at a bakery for almojábana, which is delicious bread made from corn flour, cheese, eggs and milk. I am falling in love with the bread and cheeses here. After the short stop in El Peñól, we made our way to Guatapé. 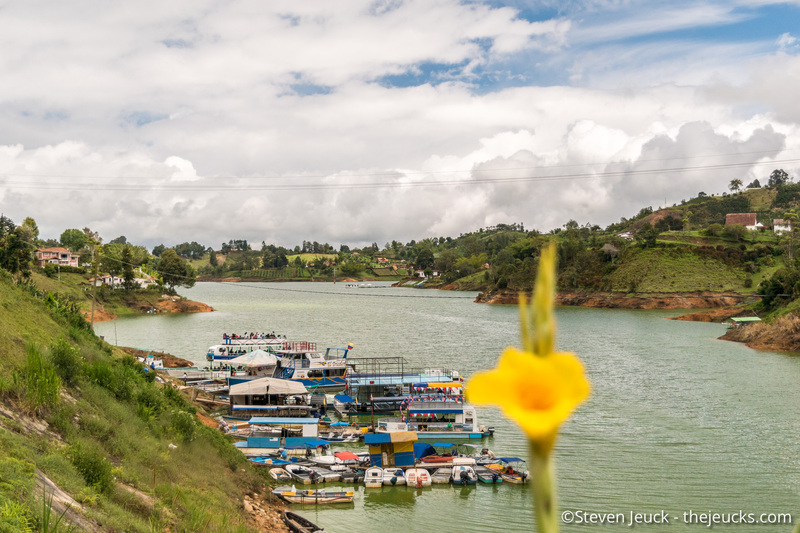 On the drive, Jose pointed out Embalse El Peñól-Guatapé (a reservoir), created in the 1960s by the government by building a dam for hydroelectric power. He told us that there was once a city in the valley before the dam was built, but once it was built the city became part of the reservoir. The citizens knew it was happening and rebuilt their city a short distance away. The dam generates 30% of all Colombia’s electricity. When looking at the reservoir, you can still make out the top of the church cross emerging from the lake in the distance. 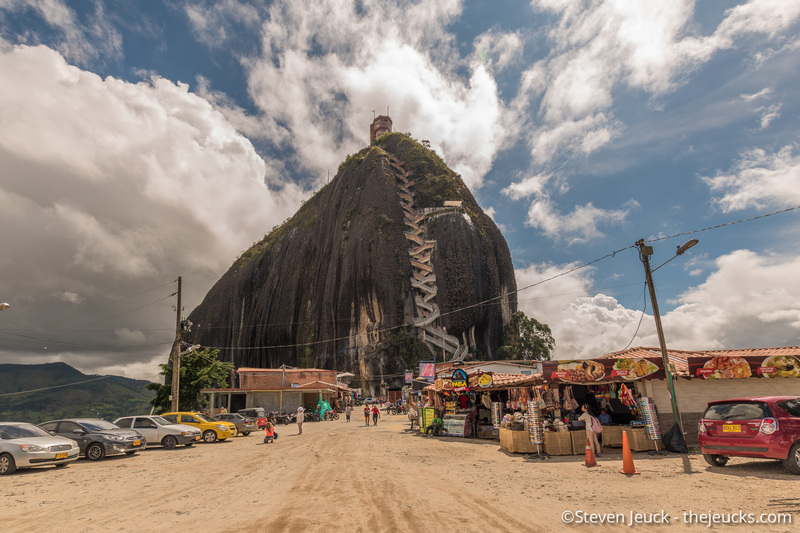 The main attraction in Guatapé is La Piedra (translates to “The Rock”). La Piedra is a monolithic formation, believed to be made from volcanic eruption, and contains granite, quartz and feldspar. We decided to climb the 700+ steps to the top, for 10,000 COB each. The top of the rock is 7,000 feet above sea level. The views are breathtaking. Once on top, there are plenty of merchants you can buy food, drinks, beer and souvenirs. There is also an unspoken camaraderie between everyone, as we all accomplished a challenging task, at such a high altitude. People are celebrating, singing, dancing, and enjoying the view. Driving through Guatapé delighted us with houses of bright colors, paintings, and smiling faces. 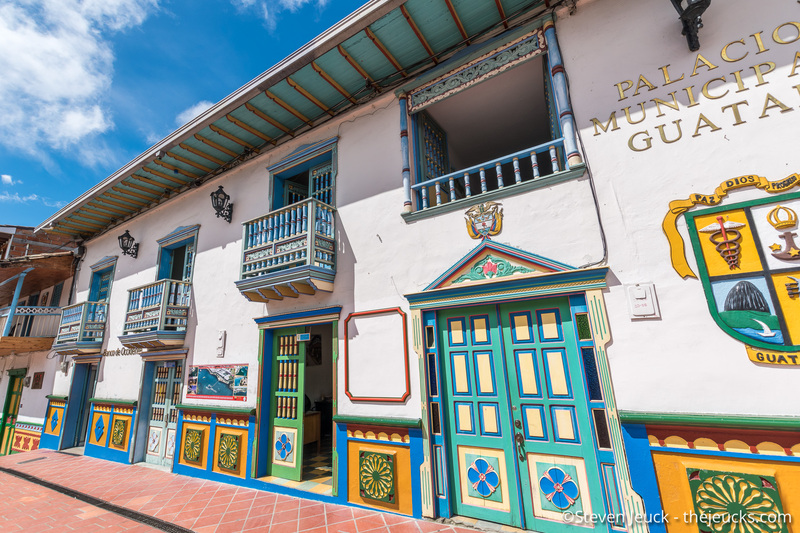 It is often described as the most colorful town in Colombia. Each building has colorful tiles, zócalos, with images of products sold, farming, or religious symbols. 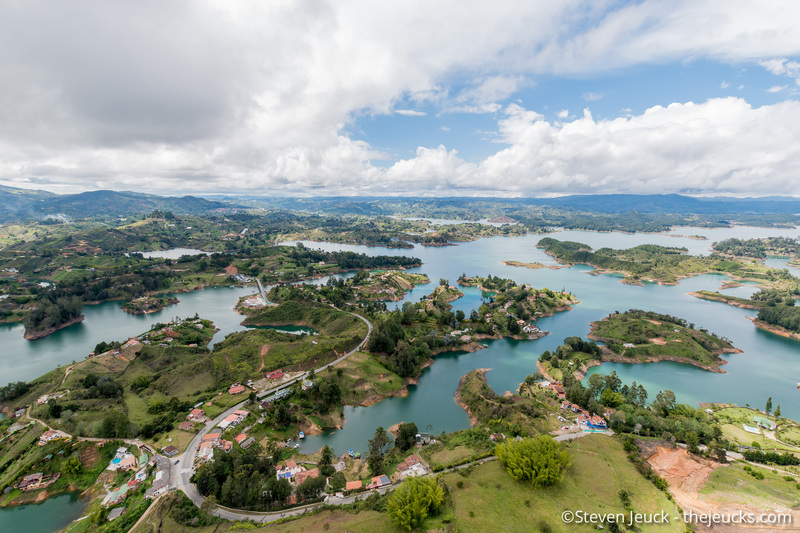 Guatapé is often a getaway place for local Colombians, as well as distant travelers. Their friendly businesses, hotels, and rental resorts seem to do really well here. 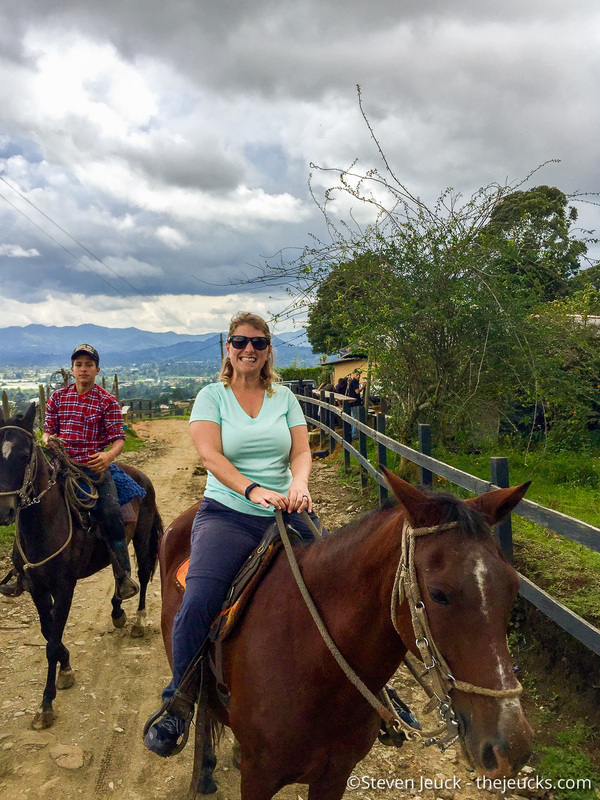 Our last stop before the trip to Medellín, was a horseback riding experience in the hills above Rionegro. This was Steve’s first experience on a horse, and my second. We did a 3-hour tour of nearby ranches, farms and open fields. The trail led to a hilltop and we enjoyed a break from the horses in a scenic area. Of course, just minutes away from the ranch, it started raining. Rain here is unlike any other. It seems to come out of nowhere. I wasn’t sure who was more excited to be back, us or the horses. We are exploring the beautiful city of Medellin!